The immune response to infection with tuberculosis is primarily cell mediated, with "hypersensitivity" to mycobacterial antigens - this causes caseating granulomas and tissue destruction. The primary site of infection in the lung (Ghon focus) is typically in the lower part of an upper lobe or upper part of a lower lobe, which are the regions of greatest air flow. It is usually subpleural and quite often causes a small pleural effusion. The enlarged lymph nodes of the primary complex may cause bronchial compression and distal atelectasis (collapse of the lung). Most cases of primary tuberculosis heal at this stage, leaving only a small fibrocalcific scar in the lung and mediastinum, sometimes visible on x-ray. If the primary complex is not be contained, spread along the lymphatics or via the bronchi can result in tuberculous bronchopneumonia. Or, bacilli can gain access to the bloodstream and depending upon the load the result is subacute haematogenous dissemination (leading to isolated organ tuberculosis) or miliary tuberculosis. There is no clinical history recorded for this case. The child would probably have presented with fever and a brassy cough, the cough being due to compression of major airways by the enlarged lymph nodes. The specimen consists of the lungs and mediastinum of an infant. In the lower lobe of the left lung on its medial aspect there is a caseous focus, the Ghon focus. Bacilli have drained to the tracheobronchial and mediastinal nodes which have also caseated. 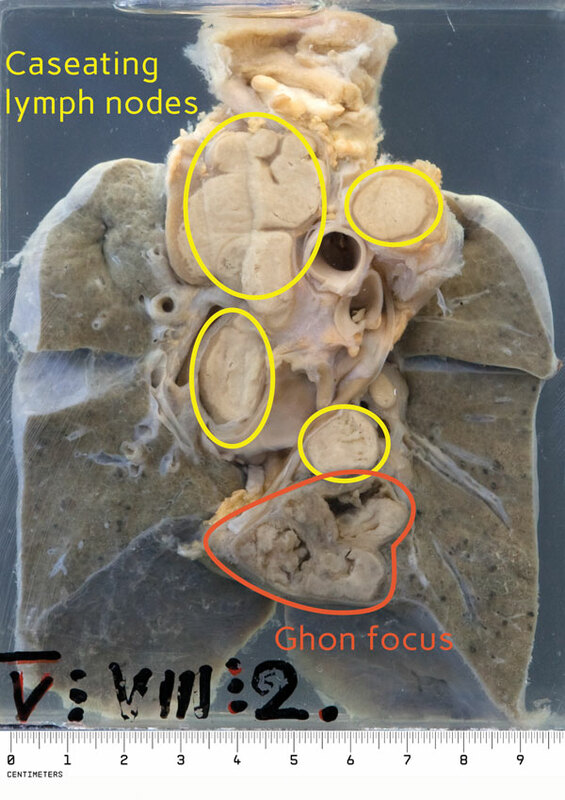 The Ghon focus in the lung together with the involved hilar nodes form the primary complex or Ghon complex. Anton Ghon was an Austrian pathologist who was a specialist in the field of bacteriology, and wrote a treatise of childhood tuberculosis called Der primäre Lungenherd bei der Tuberkulose der Kinder (1912).